Creative ways to save discarded Violins! I have been working hard this winter on projects for my children's school's annual art auction. It's been a blast! A local music store, Audubon Strings donated 3 beat up violins and I was challenged to come up with ways the 3 second grade classes and I could turn them into pieces of art. 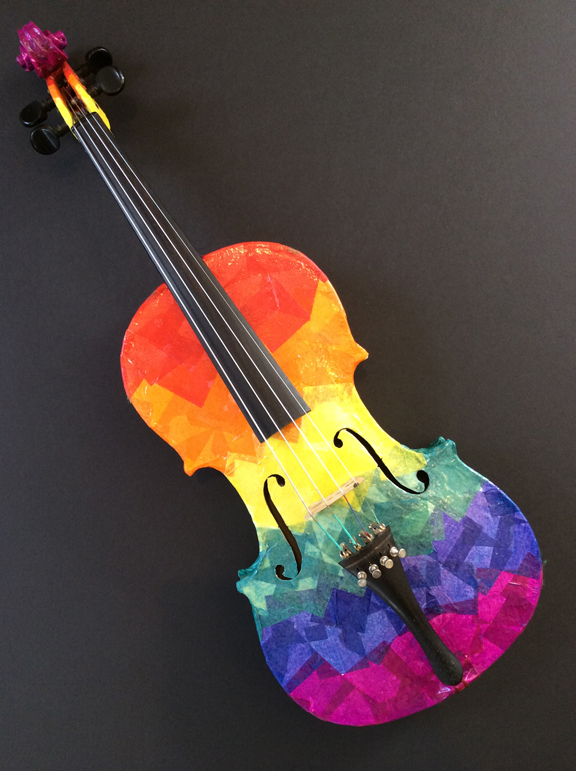 Well, above is Ms. Schofield's "Rainbow" violin. It is decoupaged with tissue squares. The kids also got to sign the back of each violin which makes them even more special to the parent who bids on them! The one problem I ran into with this execution was that once wet, tissue tears easily so the kids had to be extra careful not to press too hard when painting them into place. George Youngblood, a talented guitar "Doctor" graciously offered to restring them for us and while at it, he fixed some of the things that were wrong with them so technically they can now be played!